The quality of being unthinkable; incapable of being thought. 1. Want of thought or reflection; thoughtlessness, heedlessness, negligence; inadvertence. 2. Lacking the faculty of thought. Unthinkingly, thoughtlessly, without consideration or reflection. Not thought of; unexpected; unpremeditated. Unthinking; destitute of the thinking faculty. 1. Incapable of being corrected or amended. 2. Unable to be corrected or changed. 1. Someone who is unmanageable and unable to be corrected or changed; even when punished. 2. 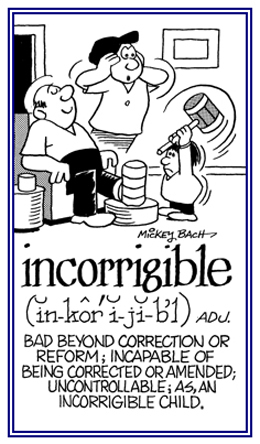 Incapable of being corrected or reformed; such as, an incorrigible criminal. 3. 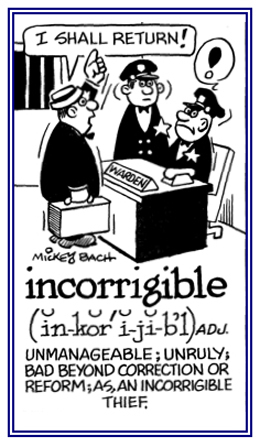 Difficult or impossible to control or to manage: "She was an incorrigible, spoiled child." 4. Impossible or very difficult to control or keep in order. 5. 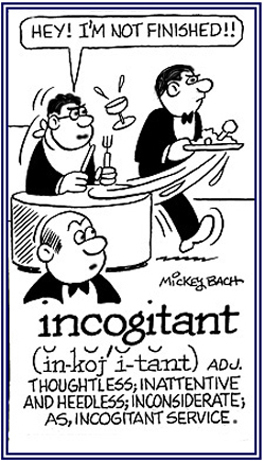 Etymology: from Old French incorrigible, or directly from Latin incorrigibilis, "not to be corrected"; from in-, "not" + corrigere, "to correct". © ALL rights are reserved. Showing page 10 out of 15 pages of 217 main-word entries or main-word-entry groups.